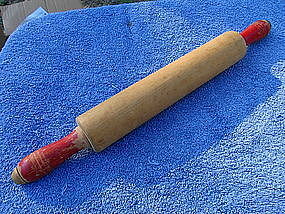 Well used wooden rolling pin with the original paint. It is 17 inches in length. The handles have nicely detailed rings. There are no splits or chips to the wood, but the tips of the handles show considerable wear. As you can see in the photo, there is loss to the red paint, but I am not a fan of touching up these old pieces and proudly displayed this in my kitchen for many years. It really should be cleaned, but just never wanted to damage the finish. Complete detailed condition photos by email. I need your zip code to calculate the postage.